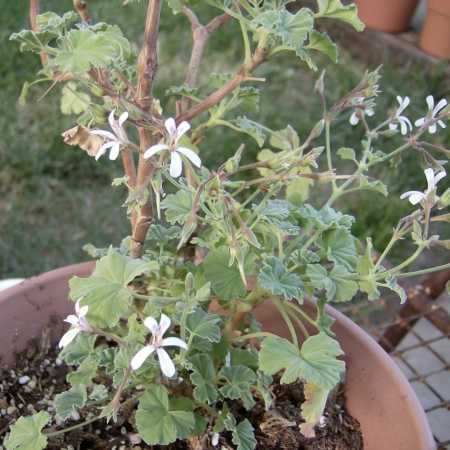 As you can see, Nutmeg Geranium is covered with flowers and seed heads. The same goes for P. odoratissimum (Apple). P. grossularioides (Coconut) – always a vigorous seed producer – is just getting started. There are two small-scale seed producers so far this year: P. ‘Strawberry’ has three cranesbills forming. Also, P. x fragrans ‘Snowy Nutmeg’ has produced a few seedheads. Will the seedlings be variegated like the parent? And then, a zonal geranium called ‘Patriot Salmon Chic’ has nine seedheads so far, but who knows if they will reproduce true. And besides that, the tag says “Do not propagate”.